Hello again all! I know I have been away for quite a while, and so much has changed! I needed a little blogging-break and time to process everything new in my life, including my pregnancy. I am beyond excited to become a mom! The past few months have been a bit of a whirlwind. Food aversions, sleepless nights, and a growing belly are now a part of my everyday life. I am seeing so many changes to my body and it is truly amazing to watch. I am finally starting to feel her move around and it is the best feeling in the world. 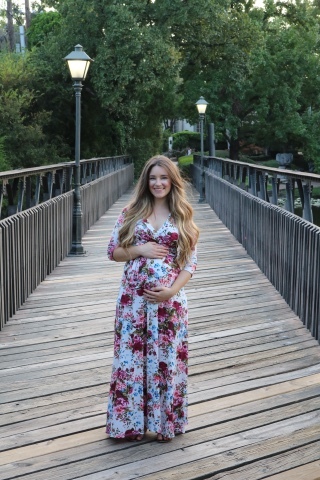 I already feel so connected to my little girl and I cannot wait to meet her! 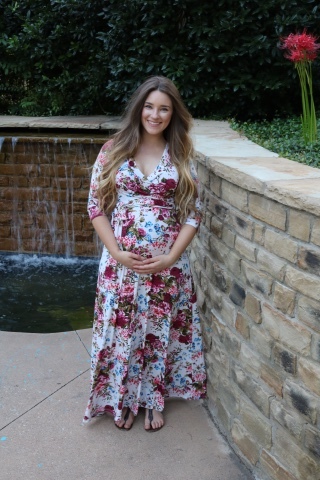 I am starting to be quite uncomfortable in my normal, non-maternity, clothes so I was so excited to discover PinkBlush. 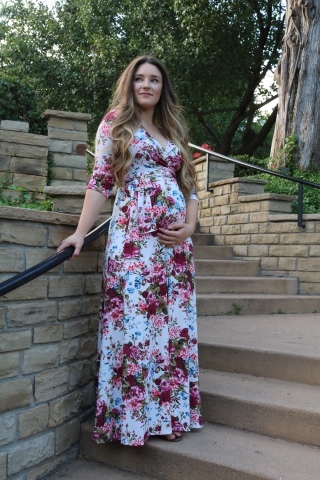 I never knew I could feel so free and comfortable in maternity clothes, yet also know I am still being fashion forward. 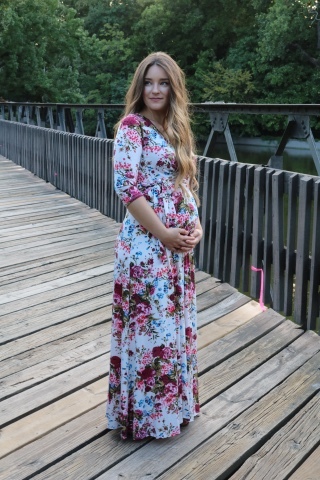 I was not expecting maternity wear to be so cute! I particularly fell in love with this dress. I love how elegant a maxi dress can make you look, and its difficult to feel elegant these days. I also love the colors in this dress. I am thrilled to be having a girl, so I like to wear as much pink as possible without being to in-your-face about it. It is so comfortable, beautiful, and easy, three things all of my favorite pieces have in common. I see myself getting a ton of use out of this dress in the near future. I also love that it can be worn postpartum as well. 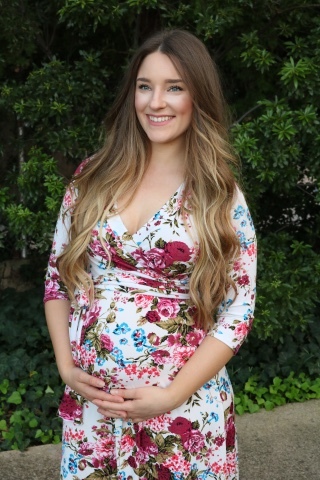 Its hard to find clothing that can be worn both during and after pregnancy, so I feel that adds even more appeal to this dress. 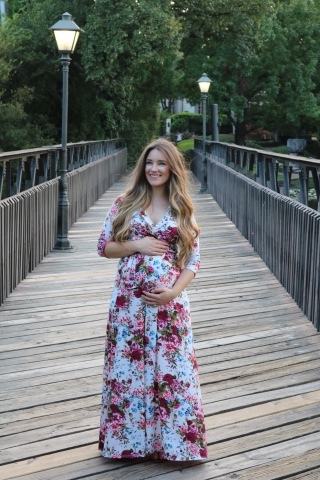 I cannot wait to snag a few more awesome pieces from PinkBlush to expand my pregnancy wardrobe! Hey, you are looking beautiful on this outfit. Currently, I am pregnant with my first baby. And I feel I need some maternity clothes for me cause I am not comfortable with my regular clothes. Some of my friends suggested me to visit black maternity tights. If you had more insight into it, I would much appreciate it. Thank you. As a woman, I know how much is essential maternity clothes for women during the pregnancy period. For this, we should find out a source where we could found our regular maternity clothes. When I was pregnant, I take my all maternity clothes from here. If you need you can check it out. Thank you. I was simply amazed at the architecture of this absolutely beautiful venue!! The environment was unbelievable. I was fortunate enough to visit LA venue like this, we found awesome things one after another after another.